How does it feel to be desired by every man and envied by every woman? Wonderful. This is the life Nora Sinclair has dreamed about, the life she's worked hard for, the life she will never give up. She doesn't just attract men, she enthralls them. So why is FBI agent John O'Hara interested in Nora Sinclair? Mysterious things happen to people around her, especially the men. And there is something dangerous about Nora, something that lures O'Hara at the same time that it fills him with fear. Is something dark hidden in the gaps of her past? As O'Hara spends more and more time getting to know her, is he pursuing justice? Or his own fatal obsession? I am on a roll here with titles by James Patterson and this time round, it's Honeymoon which he co-wrote with Howard Roughan. You know my opinion in the area but never mind, as long as I get to read nice thriller, I am not complaining. I thoroughly enjoyed Honeymoon. It is a typical current James Patterson thriller written in short chapters that just entice you to turn the pages. Why I say current is because it is very different from his books of yesteryears like Along Came a Spider but I guess the author James Patterson now is a brand James Patterson. While Honeymoon is a wonderful book of which I highly recommend but it is also not a memorable book. As at now, I quite forgot the storyline but since I have exchange this thriller with another fabulous book by another mega author I would not have the opportunity to re-read it unless I come across another copy for same in years to come. 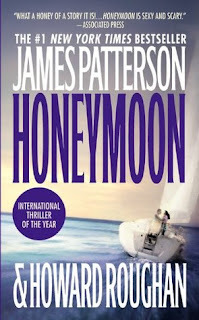 Anyway, fan or no fan, if you are looking for a thriller, you can go with Honeymoon.